Typek, the A4 paper that is used by many businesses, launched a new consumer campaign. One that will make you sit up and take note. The ‘Live a Life of Note’ campaign, a fresh media campaign aimed at everyone who has come to trust the paper in the red box, launched on 29 October and is set to create excitement, with ‘firsts’ for the brand and an exciting competition for people to showcase the small inspirational things that make theirs, a life less ordinary. 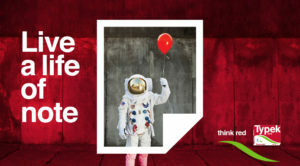 “As a leading brand of multi-purpose office paper, Typek believes that if anything is worth doing, then it is worth doing well, which is why Typek wants you to live a life of note… and reward you for it. Just as we do our best to make sure Typek is as good as it can be, we want people to be inspired to ensure that their life is as good as it can be, too,” says Richard Wells Vice President Sales and Marketing Sappi Paper and Paper Packaging. The campaign theme ‘Live a Life of Note’ is all about the small things and it challenges consumers to do something extraordinary in their own environment. Waking up half an hour earlier to watch the sunrise. Baking with their kids, running a half marathon (or doing a Park Run), starting to save for a dream trip. Little things that make their corner of the globe a bit better; and random acts of kindness that uplift other people. Various out-of-home activations communicate the message. This include large format billboards which will rotate on various highways and street pole adverts that will supplement Typek’s presence around key areas in Gauteng. It further includes an integrated social media campaign with always-on content – created and curated for Typek – with an exciting competition, kicking off on 05 November 2018, where one person could win R10 000 when they share how they ‘Live a Life of Note’. Arresting, quirky images used in creative spaces sets the visual tone for the message throughout. 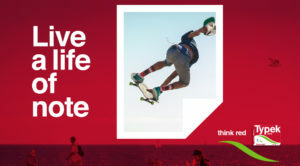 “We are very excited about the ‘Live a Life of Note’ campaign. It involves ‘firsts’ for Typek, such as our social media campaign. Typek is a trusted brand and we want more people to associate with the campaign ethos. We are also extremely proud that it asks the public to live their best lives – whatever that looks like for them – and share that with other people,” says Michelle Thain, Sappi Paper and Paper Packaging’s General Manager for Office, Tissue and Timber. This campaign will create exposure for Typek and expresses a message to everyone who engages with the brand to instantly “think Typek red” and understand what the Typek brand stands for.